Free Shipping Included! 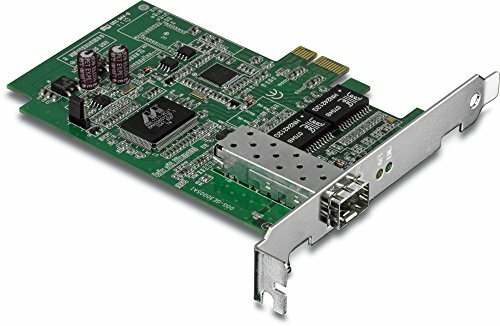 TRENDnet SFP PCIe Adapter, Gigabit 2000 Mbps, Full-Duplex, Compatible with Windows/Mac/Linux, TEG-ECSFP by TRENDnet at Pacs BG. MPN: TEG-ECSFP. Hurry! Limited time offer. Offer valid only while supplies last. TRENDnet’s SFP PCIe Adapter, model TEG-ECSFP, converts a free PCI Express slot into an SFP fiber slot compatible with standard SFP modules. TRENDnet’s SFP PCIe Adapter, model TEG-ECSFP, converts a free PCI Express slot into an SFP fiber slot compatible with standard SFP modules. Advanced features include Jumbo Frame, Layer 2 Priority tagging, VLAN tagging, and SNMP support. The included standard bracket is compatible with Windows, Mac, and Linux tower computer designs.